The February Issue of All You Magazine will contain $80.36 worth of coupons. The new issue normally hits the new stand the last week of the month. Check out the All You Coupon Index: February 2011 to find out what coupons are in this months issue. 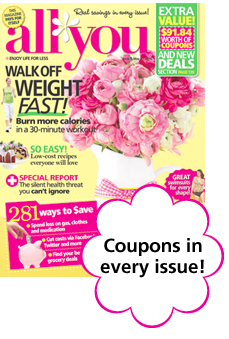 Besides the coupons in this issue, don’t forget to check out All You Exclusive online printable coupons. They update the coupons frequently, so check back for the latest printable coupons.